The twin concepts of righteousness (tzadeqah) and justice (mishpat), as developed in the Bible, have always resonated with me strongly. When tied together there, they connote the modern-day concept of “social justice”—fairness, generosity, and equity for people of all races, classes, and genders. “The Lord loves social justice,” David sings in Psalm 33:5. “I am the Lord, who exercises kindness and social justice on earth, for in these I delight,” God says through Jeremiah in 9:23. If God loves and delights in social justice, then his people ought to too. Where it’s absent, we ought to call it forth, speaking truth to power and doing all we can to enact this biblical value in our daily lives. One artist known for his commitment to social justice is Steve Prince, whose linocut Wailing Wall: Song for Quin visualizes intense yearning for something that is not yet but should be. It shows seven individuals circling a fortified wall, crying out in lament. Above them are two towers, each manned by an armed guard. Searchlights reveal three angels flying on the premises—one of them appears to have been shot. Prince lets us peer all the way inside the main figures, down to their muscle, tissue, and bone, as if to reveal the deeply embedded source of their cries. They very literally bare their souls, which emerge as ghostly figures from different parts of their bodies—their lungs, their arms, their lips, their hands, their hearts, their guts. These are spirits of justice that they send out into the world, and they’re so powerful that they’ve set a crack in the lower right corner of the wall. When I first saw the linocut, I immediately thought of the seven Israelite priests who, according to the Book of Joshua, marched around the wall of Jericho seven times blowing trumpets, which along with the shouts of the Israelite army sent the wall tumbling down. Enslaved black communities in the antebellum American South read the wall of this story as a symbol of systematic oppression. Through spirituals like “Joshua Fought the Battle of Jericho,” they prayed for a day when that oppression would be dismantled. The walls of Jericho are symbolic of a long-standing tradition which kept the ex-slaves out of Canaan, their promised land. . . . Only the most naïve reader misses the point that what Joshua did can be done again and again, wherever wrong and evil are to be overthrown. . . . Once the walls are down, the ex-slaves walk into the capital of Canaan, free men in a free land. In addition to the Battle of Jericho, this linocut references the Western Wall in Jerusalem, where Jews especially, but also Christians, go to pray. We are witnessing large sectors of our population being branded with a new-age “Scarlet Letter” P, for prisoner, and disenfranchised from voting, housing, and jobs. The vicious cycle of prison to community to prison again needs to be broken. . . . The piece calls for us as Christians to rise up and pray like Joshua of old, to speak a word to the foundations of these systems of incarceration that are stealing the ability of the people to soar with the wings of freedom we were born with. Wailing Wall reminds me of my obligation as a Christian to raise up my wail and join the march. There are a lot of walls that need toppling, but we need not be discouraged because God is on our side. This meditation is adapted from an article originally published on theJesusQuestion.org. 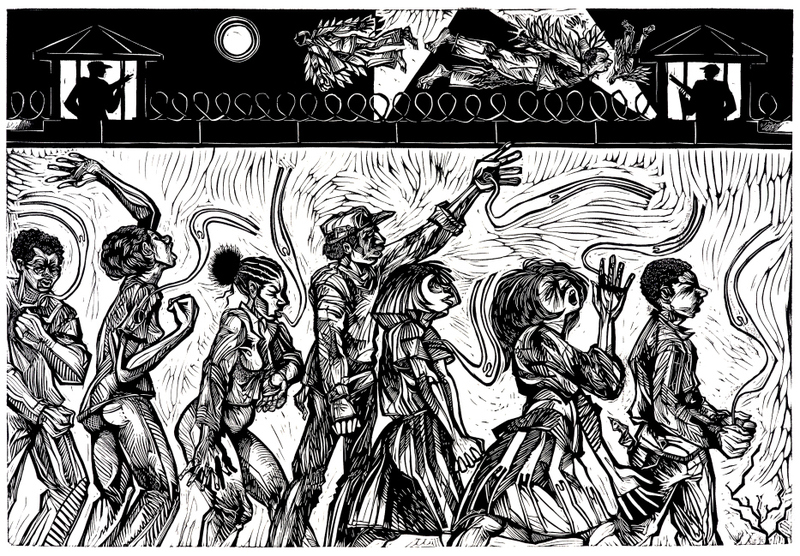 Steve Prince: Wailing Wall: Song for Quin, 2009, linocut, 24 x 36 in. Collection of Victoria Emily Jones. 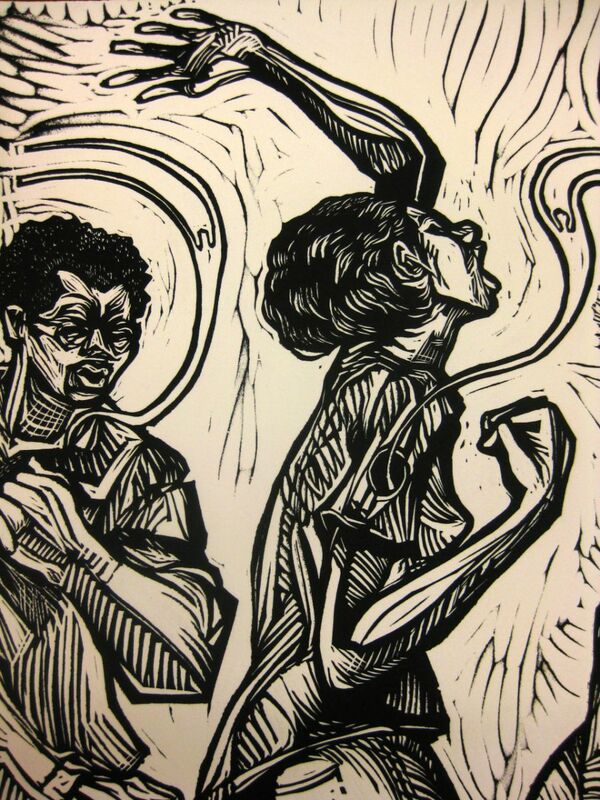 Steve Prince is an award-winning artist, educator, and evangelist whose primary mediums are printmaking and drawing. He uses his art as a means of exploring his faith and its relationship to his life, his culture, and his community. A native of New Orleans (but residing now in Pennsylvania), he is heavily influenced by the city’s rich tradition of art, music, and religion, which can be observed in his work, especially the concept of a “second line”—the part of a New Orleans jazz funeral in which the dirge gives way to an upbeat, celebratory tune accompanied by dancing. Victoria Emily Jones lives in the Baltimore area, where she works as an editorial freelancer and blogs at the http://theJesusQuestion.org. Her educational background is in journalism, English literature, and music, but her current research focuses on ways in which the visual arts can stimulate renewed theological engagement with the Bible. She is in the process of developing an online biblical art gallery, a selective collection of artworks from all eras that engage with specific texts of scripture.